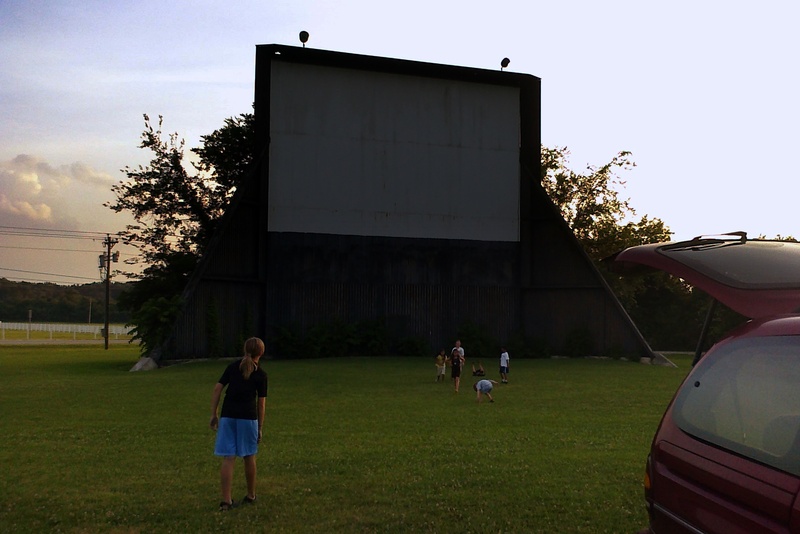 The closest drive-in to our house is the Hi-Way 50 Drive-In, 45 minutes away in Lewisburg, Tennessee. The movie was Shrek Forever After. We weren’t big on seeing it, because the last Shrek was so bad, but, really, we weren’t sure the kids would like seeing any movie at a drive-in. We warned them the picture would be darker and muddier than the movies we watch at home. It wouldn’t be 3-D, like Shrek at the theater in the town where we live. Insects and cars passing by were the closest we’d get to surround sound. We got there around 7:30. My wife worried that we’d have trouble finding a place to park, but it wasn’t too crowded, and we found a spot on the front row. She’d also wondered driving down whether there’d be a lot of teenagers, but it was mostly families. Before the movie, a bunch of kids played football in the field in front of the screen while my daughter and I played catch (until Junior decided to turn it into a game of monkey in the middle and took off with the ball). We settled into our lawn chairs at dusk, and around 8:30, the movie started. Our daughter wanted to make an ice cream run about 30 minutes in, but other than that, the kids weren’t too fidgety. No one complained about the heat or the bugs or the crappy sound on the radio (drive-ins stopped using pole-mounted speakers years ago). When it was over, we waited while a guy used our jumper cables to start his truck, and then we headed home. Junior was asleep before we pulled onto the highway. “That was good,” our 10-year-old daughter volunteered, sleepily. What was good? I asked. The movie or just going to a drive-in? Previous postDo you call them lightning bugs or fireflies? We, too, are wanting to take our kids to a drive-in before they are all gone and are in the process of locating one close to our area. Sounds like you and your family overall had a nice time minus all of the glitz and comfort of a movie theater. Some of my best memories were going to the drive-in in Paintsville. First movie I ever saw there was Grease. Thanks for sharing this with us. Somewhere, I have a picture of them pulling down the screen at the Sky-Vue. If I find it, I’ll post it. I found myself thinking about the first time I went to a drive-in (E.T., 1982) and after a quick Google search I found this gem of a post. America: take your kids to a drive-in!